After my successful creation of heart-shaped bath bombs for Valentine’s Day (or any time), I am obsessed with making my own bath bombs. It is so easy, and the kids love them. They also make a fantastic gift. After making homemade Easter Eggs Sidewalk Chalk, I realized I could also make Homemade Easter Egg Bath Bombs. So simple, and so cute! Wouldn’t they be great in an Easter Basket?! I started with the recipe I used to make the heart-shaped bath bombs, but I didn’t need as many so I halved it. I also discovered that because I was packing two molds together, the mixture need more moisture. You could add a bit of water, but you have to be so careful because it will activate your Citric Acid, so I just use more oil. * Unable to find Citric Acid locally, I finally found Citric Acid on Amazon. One pound of Citric Acid = 2 cups. Your mixture should be crumbly, but not saturated. You should be able to squeeze a handful together into a clump, then rub your hands together to break it back up into crumbles. Next scoop the mixture into your plastic eggs. Pack it into the mold super tight, and overflow the mixture before you squeeze the egg halves together. As you put the halves together, extra will come out the sides. Just brush it away and squeeze your mold tight. Unlike the heart molds that I left overnight, you want to take your bomb out of the egg as soon as you make it. To do so gently squeeze the sides of the egg to loosen it. Then when it feels loose, slide it off in a circular motion — like you are screwing it off. Next squeeze the sides other half of the egg mold until it feels loose and slide it off, also in a circular motion. If the egg crumbles as you take it out, or you don’t like the way it looks – just dump it back into your bowl and try again. If the halves won’t stick together, add another tablespoon of oil. Lay the eggs, gently, on a towel to dry for two days. I packaged a couple of the Easter Egg Bath Bombs up in cellophane bags with a little tag for an easy gift or Easter Basket stuffer. 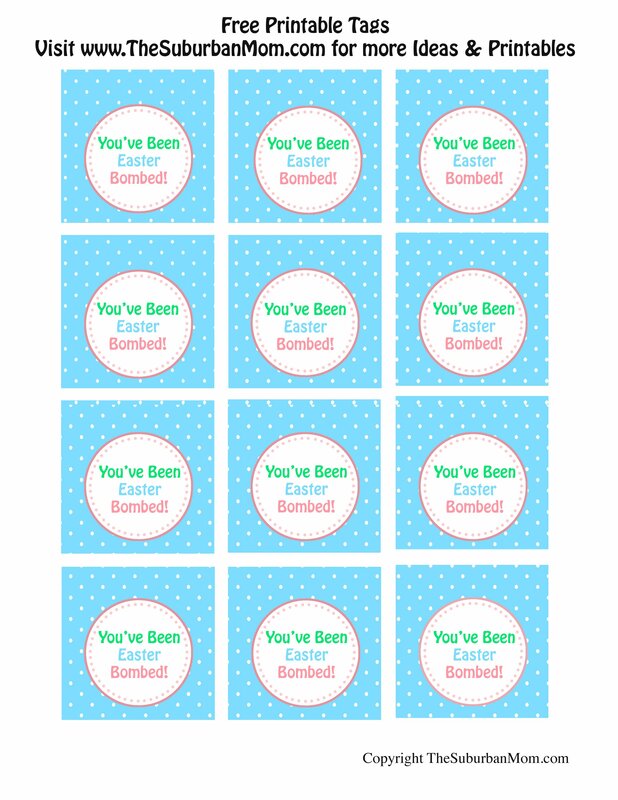 Download your Easter Egg Bath Bomb tags here. To print your tags, click the link above and print on cardstock paper. The tags can be punched out with either a two-inch circle punch or a two-inch scallop punch. If you don’t have a punch, you can cut our square tags from the printable. These are so cute, I will have to share this on Pinterest. Coming over from Bloom Designs today. I commented on your chalk too 🙂 These are so great! Pinned! Oh my, I am so excited to share this with my daughter when she gets home from school today! I just need to raid my mom’s essential oils and we can get started:) Thanks for the fun! Hey Jen,I have featured your bath bombs. I had a hard time choosing which one, the bombs or the chalk? But Im a sucker for bath bombs! Thanks so much for sharing this on Worthwhile Wednesdays (http://thecraftiestallie.blogspot.com). Hi! Stopping by from Flour Me with Love’s Mix It Up Monday link up. These are so cute! I’ve pinned it to try later. Thanks for sharing! These are adorable. I love the colors. What a fun idea! I have never even used a bath bomb before but it sounds like my kids would love them! I don’t use essential oils so is there something I can substitute? Hi Wanda – the tag in the picture was made with a 2-inch scallop punch, so the file fits 2-inch circles. My guess is that you probably printed the preview instead of downloading the tags by mistake. When you click on the tags, they will open in another window. (Don’t print that screen.) Next, right click on the tags to save the tags to your computer. Once they are saved to your computer, open the file and it will print full size. A few tips from an experienced bath bomb maker…I find it much easier to mold egg shaped bath bombs by using the plastic eggs that are split longways (vertical). It releases much, much easier. Also, if you want to avoid that harsh line in the middle, try using two of the same side of the egg. Meaning, they won’t snap together because they are the same. Hope this helps! What kind of oil did you use besides the essential oil?